I am a Research Fellow at the MRC/CSO Social and Public Health Sciences Unit at the University of Glasgow, and I work within a programme of research around Informing Health Public Policy. My research interests include complex interventions, health inequalities, multimorbidity, and how public policy affects health. I feel privileged to be chairing the ECR committee of SSM in 2019. I am enthusiastic about making sure ECRs are supported in their roles, and are able to get the most from their involvement in SSM. I look forward to engaging with and supporting fellow ECRs in my role on the committee more broadly. I am a Research Associate with the Food Systems and Public Health programme at the MRC Epidemiology Unit, University of Cambridge. Currently I am supporting the system level evaluation of the Soft Drinks Industry Levy, a nation-wide policy to reduce sugar in soft drinks by targeting importers and manufacturers. The evaluation serves as the first study grounded in a ‘systems approach’ to evaluate whether, how and in whom the levy has an effect on health. Broadly, my research interests are to improve the prevention of obesity and chronic disease by studying the effects of food system change on population level diet and health. ‘My role will involve supporting the Chair and supporting ECR activities and fostering dialogue. I am a PhD researcher at the School of Public Health, University College Cork. My background is in clinical-health psychology and my PhD is focused on supporting implementation of recommendations for psychological aspects of diabetes in primary care in Ireland. I am interested in implementation science, intervention development, psychological aspects of obesity and diabetes, stress and food choice. I am really excited to be one of the Local Officers on the SSM ECR subcommittee this year. My main responsibility in this role is to organise the ECR workshop as part of the SSM Annual Scientific Meeting. 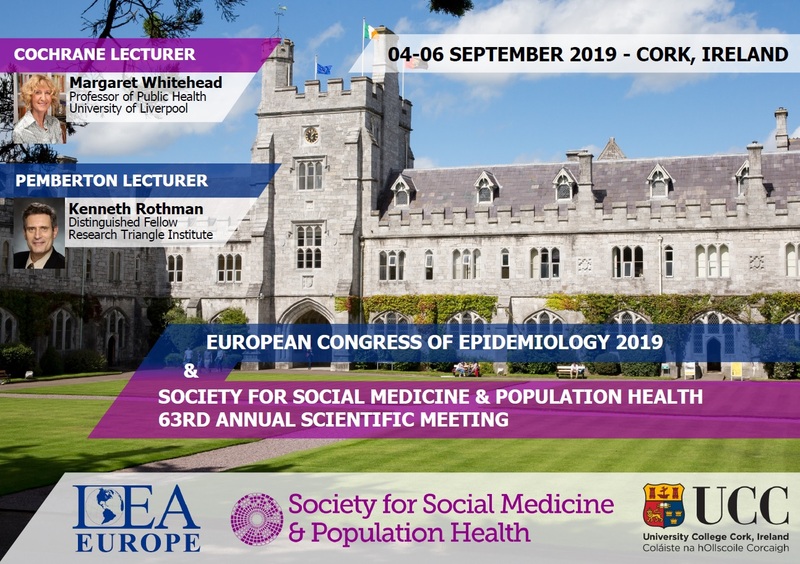 I am looking forward to welcoming SSM ECRs to Cork this year for the event. I am a Research Assistant within the MRC/CSO Social and Public Health Sciences Unit at the University of Glasgow and a final year PhD student at the University of Stirling. I am currently investigating how social inequalities affect child health using causal pathways, and completing my PhD which looks at how best to measure multimorbidity in predicting health and social care outcomes among older people as well as examining what specific multimorbidity “scores” and conditions predict greatest need for health and social care services. As Communications Officer I am looking forward to relaying key issues such as opportunities for career development to ECRs such as workshops and courses (SSM-led or otherwise). I will also play a part in covering next year’s conference and accompanying workshop on social media for the benefit of ECR members. I am a postgraduate student in the Faculty of Health and Wellbeing at the University of Central Lancashire (UCLan). In 2010 I qualified as a physiotherapist, before completing an MA in Health Promotion at the National University of Ireland, Galway. Prior to starting my postgraduate studies, I worked as a Research Physiotherapist in the Stroke Research Team at UCLan. This research examined innovative approaches to increasing upper limb exercise in stroke rehabilitation units. My MPhil/PhD research is funded by the NIHR Collaboration for Leadership in Applied Health Research and Care (CLAHRC) North West Coast. I am looking at interdisciplinary perspectives of upstream action to reduce health inequalities. I am delighted to be involved with the SSM ECR Subcommittee to assist with developing the Network Platform. I look forward to promoting and facilitating a positive and safe online space that can work to develop ideas and collaboration within the SSM community. I am currently a PhD student in Social Statistics based in Cathie Marsh Institute for Social Research (CMI) at the University of Manchester. My PhD research focuses on missing data which may affect the association between socioeconomic position and biomarkers in older adults. My background is in public health, health promotion, and social epidemiology. As a member of the SSM ECR Subcommittee, I hope to contribute to the team by developing the SSM ECR newsletter and keep ECRs up-to-date regarding ECR activities, training events and courses, job opportunities, and conferences. I am a post-doctoral Research Fellow in the Epidemiology and Public Health Research Group at the University of Exeter Medical School. My background is in epidemiology and my current research focuses on understanding factors associated with healthy ageing and longevity. Prior to moving to Exeter, I completed a PhD at UCL exploring the effects of body composition and dietary patterns on the risk of cardiovascular disease and mortality in older age. As a SSM ECR Subcommittee member, I hope to contribute to developing the Network Platform, therefore helping SSM members to connect on shared research interests and encouraging collaborations across institutes. I also hope to assist in a mentoring scheme that is supportive and valuable for SSM Early Career Researchers.